The sonorous expanse that is Toronto’s artistic vestibule is speckled with independent start-up labels, each orbiting uniquely around the city’s cache of raw talent. In this voluminous climate, Justin Scott Gray, founder of Amok Recordings, is attuned to the ‘global character’ of Canada’s do-it-yourself and do-it-together musical landscape. Creative collaboration between projects emerges as a new language, the semiotics of which —- given the prominence of talent and people motivated in providing it with a collective roof —- speak to the ever loudening typologies that strengthen the presence of our northernly crucibles. It is here, in this space of global cross-pollination, that Amok Recordings has established itself as a progenitor of music that navigates across borders, both geographically and stylistically speaking. We spoke to the founder of the Toronto via Elliot Lake experimental label about Amok’s birth, evolution and ongoing communication. Joshua Robinson: How did Amok start? What was the creative push behind the inception of the imprint? Did it begin as a way for you to share your own music? As you grow, your inspiration obviously changes… For the last few years we have been focusing more on new releases and selling physical packages, rather than just archiving old material via free download. I guess the short answer to your question is yes – it began partly as a way to present the music that I was involved in. You recently returned to Toronto from Elliot Lake, Ontario. Can you comment on how these geographic spaces influenced you differently? Elliot Lake is a pretty depressing place… It began as a booming uranium mine town. Then, in the early ’90s, all of the mining companies closed. With a crippled economy, the city council moved quickly to create a for-profit company (comprised of the mayor and most of the councillors) and they re-branded the city after their new company name: “Retirement Living”. They inherited tons of liquidated cottage-homes from the former mine companies and started busing-in pensioners to fill the homes and pay the taxes. So in comparison with Toronto (where there are actually people under the age of 65), it’s a lot different! As far as the influence goes… The lack of culture really made me want to create something. Micro-independents and DIY labels seem to be incredibly prevalent, especially in the major hubs such as Toronto, which is home to Amok. Can you comment on what it is about the creative ethos of Toronto that makes it such a hot-spot for labels and musicians alike? 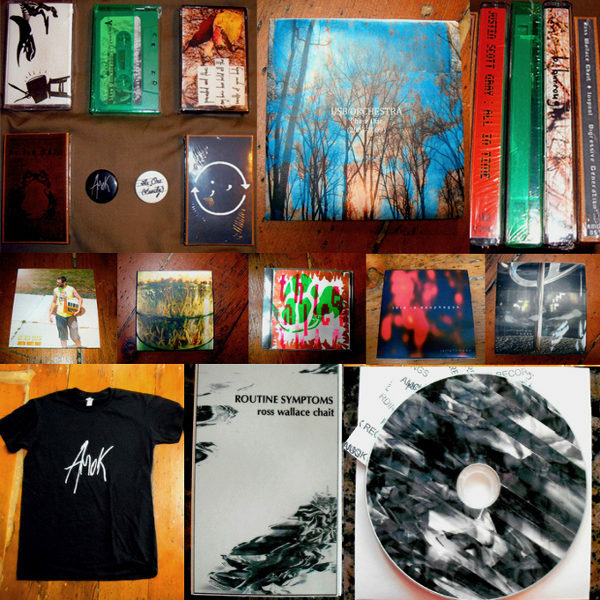 Yeah – Bandcamp alone seems to have spawned hundreds of new labels. Not being facetious but it’s probably just the sheer density of people that makes Toronto a “hot-spot”… I think that with the way technology has evolved, pretty much anyone, anywhere, can make a label. You really don’t have to be in a big city to do it! There’s just more people there doing it. Your releases seem to cover the spectrum of physical mediums quite well. However, there seems to be a bit of a preference for cassette. What does the cassette medium mean to you? Well, it is an analog format and every release that we put out has a digital counterpart… Personally, I like comparing the sound of the digital vs. the analog… I also like that it has two sides because this can really influence the way an artist works. I know that when I was making my last solo record Adult Music I really focused on the two-side format. I’ve also read articles about what it means to some other people. A few have noted that cassette culture is a “rebellion in the face of the iPhone generation,” while others chalk it up to plain nostalgia. It’s probably a bit of everything. I would release music on all formats, if I could afford it. Stylistically, your catalogue and the musicians who you have worked with are incredibly diverse. Is the strength of the electronic, ambient, and experimental communities in Toronto a reason for the prevalence of the genres on your imprint? To be honest, I have no idea what’s been going in Toronto… Like I said, I’ve been in Elliot Lake for the past few months and before that I was in Sarnia (which is as equally depressing as Elliot Lake). Also, we don’t have any other Toronto artists involved with the label (except JEFFTHEWORLD, but he makes chiptune and that’s a whole culture unto itself). The label catalogue is pretty much just music that I personally find interesting and that I think would fit together in some strange way. I don’t really focus on any given geographic location and I tend to work with people that I just think are genuine. Collaboration between artists under the Amok imprint seems to be a pretty important point of distinction for your label. Why is cross-pollination between creative projects important to you? I think that when someone is being genuine they are likely just “doing-what-they-do”, and so if you set up a network of people who “do-music” then it just makes sense that collaborations will happen… I have always found it interesting how a specific artist can act like an ingredient in a new recipe. And, as a fan, I’ve always enjoyed dissecting music and imagining what a particular artist might be adding to any given project (it becomes even more interesting once you know a particular artist’s body of work). There is some branching out of Amok to work with musicians residing beyond Canada. Can you comment on how this ‘global’ character might distinguish Amok from other Toronto-based imprints? What international communities have you been able to develop working relationships with? It’s funny because I know that Weird Canada has some strict guidelines for only covering Canadian artists, and as we discussed, much of the catalogue is comprised of releases by artists from other countries… Dare I say that this aspect of Amok is perhaps what makes us even more Canadian than your average label? Melting Pot 101. Seriously though, I don’t feel connected to any particular city. Yes, we’re Canadian. And yes, we’re currently in Toronto. But that doesn’t matter… We could still be surrounded by the elderly folks of Elliot Lake and the label would continue in the same way. That probably sets us apart from other Toronto labels. We’ve put out releases by artists from six countries and really created some strong networks in both France (Strasbourg) and the United States (Los Angeles). In France, I have been working with Nicolas Boutines who has brought us several amazing projects including his own collaborations with Pascal Gully (who has released music on John Zorn’s Tzadik label). In LA, I have been working with Jean-Paul Garnier. He is an extremely hard-working and very talented sound artist who has connected us with many other artists and organizations within the U.S. He’s even released the work of some Amok artists on his Welcome To The 21st net label. Canada is a bellowing breeding ground for DIY and independent musicians and record imprints. What is it about the creative climate of Canada that inspires and facilitates this sort of artistic fervour? I’m not sure what it is. If we’re talking specifically about “the industry“ then maybe it’s because of how spoiled we are as Canadians. A LOT of releases seem to have FACTOR or various Arts Council logos on them. There’s so much incentive for young people to ”take a couple of years off of school, start an indie band and hit the road for a while.” I’m a little jealous because we have had zero funding and it’s been an uphill battle. One final question: Do you have any upcoming releases that you are particularly excited about? I’m still pretty excited about the Ross Chait album that we just put out. As for upcoming releases, we’re getting ready to put out a new Somnaphon tape/CD and I’m really thrilled that he’s going to be a part of the label. His work is VERY interesting. FYI: he also runs his own label, Bicephalic Records, which is definitely worth checking out! t h i e f – REC. A-Mo & Amplifier Machine – Y’all Fatties Come Chew Some Freedom! USB Orchestra – Be Free. Bleepus Christ – bye, mean. L’immensité sonore qu’est le vestibule artistique de Toronto est parsemée d’étiquettes indépendantes toutes neuves, chacune orbitant de manière unique autour de la ville bouillant de talent. Plongé dans ce volumineux climat, Justin Scott Gray, le fondateur d’Amok Recordings, est accoutumé à la disposition générale pour le fait-maison et le travail d’équipe harmonieux qui régit le paysage musical canadien. De la collaboration créative entre projets émerge un nouveau langage, une sémantique qui – étant donné l’afflux de talents et de gens motivés à offrir un toit collectif – parle aux typologies de plus en plus présentes, celles qui renforcent la présence de nos creusets nordiques. C’est ici, au centre de cet espace de pollinisation croisée, qu’Amok Recordings s’est établi comme progéniteur de musique qui navigue au-delà des frontières, autant géographiques que stylistiques. Nous avons parlé avec le fondateur de l’étiquette expérimentale, en provenance de Toronto via Elliot Lake, de sa naissance, de son évolution et de sa constante communication. Joshua Robinson: Comment Amok a-t-il démarré? Quelle était la poussée créative derrière la mise en place de l’étiquette? Est-ce que cela a commencé comme une façon de partager ta propre musique? En grandissant, l’inspiration change… Au cours des dernières années, nous nous sommes concentré de plus en plus sur les nouvelles sorties et les paquets physiques à vendre au lieu de seulement alimenter nos archives avec des téléchargements gratuits. Je pense que la réponse courte à la question est oui – cela à commencé en partie comme une façon de partager mes propres projets. Tu es récemment revenu à Toronto après avoir habité à Elliot Lake, en Ontario. Peux-tu partager de quelles manières ces espaces géographiques t’ont influencé? Elliot Lake est un endroit assez déprimant… Ça s’est développé au départ avec les mines d’uranium. Pendant les années 90, toutes les compagnies minières ont plié bagage. Avec une économie précaire, la Ville s’est adapté et a créé un organisme à but lucratif (composé principalement du maire et de ses conseillés) et ils ont ensuite présenté la ville à l’aide de leur nouveau nom d’organisme: ‘Retirement Living’. Ils avaient hérité d’une tonne de maisons-chalets à bas prix des compagnies minières et ils ont commencé à convoyer plein de retraités dans ces maisons pour qu’elles soient habitées et rapportent des taxes. Alors, en comparaison avec Toronto (où il y a effectivement des gens de moins de 65 ans qui habitent), c’est vraiment différent! Puis, en ce qui concerne l’influence du lieu… l’absence de culture m’a vraiment donné envie de créer quelque chose. Les mini-étiquettes indépendantes et fait-maison semblent incroyablement présentes, surtout dans les grands centres comme Toronto, d’où vient Amok. Peux-tu partager ce qui dans l’éthos créatif de Toronto rend les étiquettes et les artistes si prolifiques? Oui – Bandcamp semble à lui seul avoir frayé le chemin à une centaine d’étiquettes. Sans être facétieux, c’est probablement la densité de population qui fait de Toronto un point si ‘chaud’. Je pense qu’avec la manière dont la technologie a évolué, pratiquement n’importe qui n’importe où peut démarrer une étiquette. Vous n’avez pas besoin d’être dans une grande ville pour le faire! Il y a seulement plus de gens qui le font dans ces endroits-là. Tes sorties semblent couvrir très bien le large spèctre des copies physiques. Par contre, il semble y avoir une préférence pour la cassette. Qu’est ce que la cassette représente pour toi? Eh bien, c’est un format analogique et chaque sortie que nous faisons a son équvalent numérique. Personnellement, j’aime comparer le son du numérique et de l’analogique… J’aime aussi le fait que la cassette a deux faces parce que ça peut grandement influencer la manière de travailler de l’artiste. Je sais que pendant que je travaillais sur mon dernier album solo Adult Music, je me suis vraiment concentré sur le format deux-faces. J’ai aussi lu des articles pour savoir quelle importance ce format a pour d’autres gens. Quelques personnes semblent penser que le culture de la cassette est une “rébellion contre la génération iPhone”, alors que d’autres l’associent à de la simple nostalgie. C’est probablement un peu de tout. Je sortirais de la musique sous tous les formats, si je pouvais me le permettre. Le catalogue et les artistes avec lesquels tu choisis de travailler ont un style très diversifié. Est-ce que la force des scènes électronique, ambiante et expérimentale de Toronto sont responsables de leur abondance sur ton étiquette? Pour être honnête, je n’ai aucune idée de ce qui se passe à Toronto…. Comme je le disais, j’ai passé les derniers mois à Elliot Lake et juste avant j’étais à Sarnia (qui est aussi déprimant qu’Elliot Lake). Aussi, nous n’avons pas d’autres artistes de Toronto qui font partie de l’étiquette (sauf JEFFTHEWORLD, mais il fait du chiptune et c’est vraiment une culture en soi). Le catalogue de l’étiquette est pas mal juste de la musique que je trouve intéressante et qui, je crois, peut former un tout cohérent, d’une certaine façon. Je ne pense pas beaucoup aux origines géographiques des artistes et je m’entoure en général de gens qui me semblent authentiques. Les collaborations entre artistes d’Amok Recordings semblent être un élèment distinctif important pour l’étiquette. Pourquoi la pollinisation croisée entre projets créatifs est-elle si importante pour toi? Je pense que quand les gens sont authentiques, ils font d’emblée “ce-qu’ils-ont-à-faire”, alors si on connecte ensemble une bande de gens qui font de la musique, les collaborations naissent d’elles-mêmes. J’ai toujours trouvé intéressant qu’un artiste en particulier puisse être l’ingrédient d’une nouvelle recette. Et, en tant que fan, j’ai toujours aimé disséquer la musique et imaginer ce qu’un artiste en particulier pourrait apporter à un projet (ça devient encore plus intéressant quand tu connais bien l’ensemble de l’oeuvre d’un artiste). Il y a une ouverture chez Amok à travailler avec des musiciens résidant ailleurs qu’au Canada. Peux-tu nous dire comment cette caractéristque ‘globale’ pourrait permettre à Amok de se distinguer des autres étiquettes de Toronto? Avec quelles communautés internationales as-tu développé des liens? 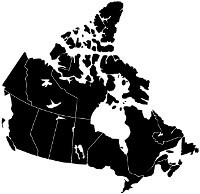 C’est drôle parce que je sais à quel point c’est une ligne directrice importante de Weird Canada que de couvrir seulement du contenu canadien et, comme nous en avons discuté, une bonne partie du catalogue comprend des sorties d’artistes d’autres pays. Est-ce que je peux me permettre de dire que cet aspect d’Amok est peut-être ce qui nous rend encore plus canadien? Melting pop 101. Sérieusement, je ne me sais pas connecté à une ville en particulier. Oui, nous sommes canadiens. Et oui, nous sommes présentement basés à Toronto. Mais ça n’a pas d’importance. Nous pourrions être entourés des aînés d’Elliot Lake et l’étiquette se comporterait de la même manière. C’est probablement ce qui nous différencie des autres étiquettes de Toronto. Nous avons produit les albums d’artistes de six pays différents et avons créé des réseaux importants en France (Strasbourg) et aux États-Unis (Los Angeles). En France, j’ai travaillé avec Nicolas Boutines, qui nous a apporté plusieurs projets étonnants, incluant une de ses propres collaborations avec Pascal Gully (qui a sortie de la musique sur l’étiquette Tzadik de John Zorn). À Los Angeles, j’ai travaillé avec Jean-Paul Garnier. C’est un artiste du son qui travaille extrêmement fort, qui est bourré de talent, et qui a connecté avec plusieurs artistes et organisations aux États-Unis. Il a même publié le travail de quelques-uns des artistes d’Amok sur son label web, Welcome to the 21st. Le Canada est le terrain d’un nombre incroyable de musiciens indépendants et d’étiquettes fait-maison. Qu’est-ce qui, dans ce climat créatif canadien, favorise et inspire si bien cette genre de ferveur artistique? Je ne suis pas certain. Si nous parlons principalement de “l’industrie”, c’est peut-être parce que nous sommes si gâtés au Canada. BEAUCOUP d’albums semblent porter le logo de FACTOR ou du Conseil des Arts. Les jeunes sont tellement incités à ‘’prendre une année sabbatique ou deux, à créer un groupe de musique et à partir en tournée un temps”. Je suis un peu jaloux parce que nous n’avons eu aucun financement et que ça a été une longue bataille. Une dernière question: Y a-t-il une publication prochaine qui t’excites particulièrement? Je suis encore très excité par l’album de Ross Chait qu’on vient de sortir. Pour les publications à venir, nous sommes en train de préparer la sortie d’un nouveau Somnaphon en format cassette/CD et je suis très content qu’il fasse partie de notre étiquette. Son travail est VRAIMENT intéressant. Pour votre info: Il a aussi sa propre étiquette, Bicephalic Records, qui vaut vraiment le détour! file under: Imprint, New Canadiana, ontario. big thank you to Josh & Annemarie for all of their hardwork!